The mission of the Truth Values Community is to create a profoundly supportive environment for graduate students in STEM through an innovative pairing of science and the arts. 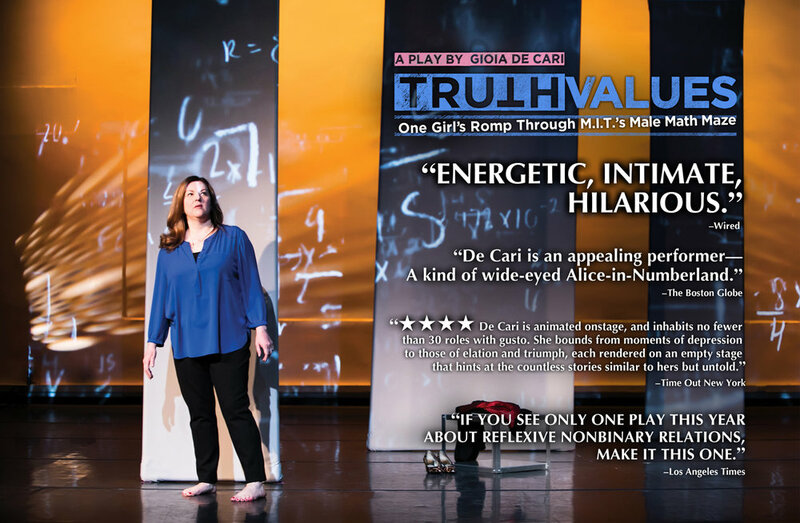 The Truth Values Community originated from conversations surrounding Founder Gioia De Cari’s award-winning national-hit play, Truth Values, an “energetic, intimate, hilarious” (Wired) autobiographical work that explores one woman’s search for identity in the mostly male world of elite mathematics. De Cari, an arts professional with an unusual background as a Ph.D. student in math at the Massachusetts Institute of Technology, had left math in the midst of her studies, joining the many women who reach a certain point in the STEM fields (Science, Technology, Engineering, Math), and then leave. She eventually made a new path for herself in the arts, in which she worked happily for over ten years while keeping her math background a secret. An uproar in the news about inherent gender differences in science and math ability caused her to consider sharing her story, which became Truth Values. Presentations of the play on tour have sparked over 75 post-show discussions with leading experts on diversity, gender bias and women in STEM, resulting in the development of an extraordinary network. The Truth Values Community is the result of De Cari’s passion to incorporate students into this network, offering students the community and mentoring she wished for during her own graduate studies. To that end, De Cari joined forces with Principal Investigator and award-winning educator Dr. Silvia Mazzula, specialist in diversity, equity and inclusion, Founder and Executive Director of the Latina Researchers Network, and Associate Professor of Psychology at John Jay College, The City University of New York (CUNY), to make this dream a reality. Gioia De Cari in Truth Values. Photo by Silvana Ximena. We are profoundly grateful to the Alfred P. Sloan Foundation for their generous funding for the pilot program to launch our community, “Creating a Community for Women Graduate Students in STEM.” We are also deeply grateful to the Massachusetts Institute of Technology’s School of Science for sponsoring a second phase of the program, for the close partnership of the Latina Researchers Network, as well as numerous other partners and sponsoring organizations. Winner of a FringeNYC Overall Excellence Award, Truth Values has been presented at more than 50 performing arts centers nationally, including the Ensemble Studio Theatre in New York, the La Jolla Playhouse, The Annenberg Center for the Performing Arts, and USC’s celebrated Visions and Voices Arts and Humanities Series, among many others. The educational companion program to Truth Values was launched in 2018 at Columbia University, and has also been presented at the Graduate Center of the City University of New York. The next program will take place at the Massachusetts Institute of Technology in April, 2019. Despite advances toward equity in STEM fields, women remain underrepresented. Although women are 50% of bachelor-level graduates in some of the sciences, they are less represented in the academic and career pipeline thereafter, as are racial and ethnic minority groups (URM). Our educational programming is based on studies that show that spending even just one quality hour with a relatable mentor can measurably affect a student’s chances of success. The addition of the play Truth Values, which has been embraced nationally as an effective conversation catalyst on the crucial topic of under-representation of women in STEM, adds humor and humanity to the conversation. Immediate post-performance discussions with prominent role models in STEM fields bring additional value for students in our programs. We warmly welcome you to join us in our efforts to support women in STEM and increase diversity in these fields.